Shuttle KD20 is an affordable 2-bay NAS box that supports up to 2 x 2TB hard drives. You can mix hard drives of different types and capacities. 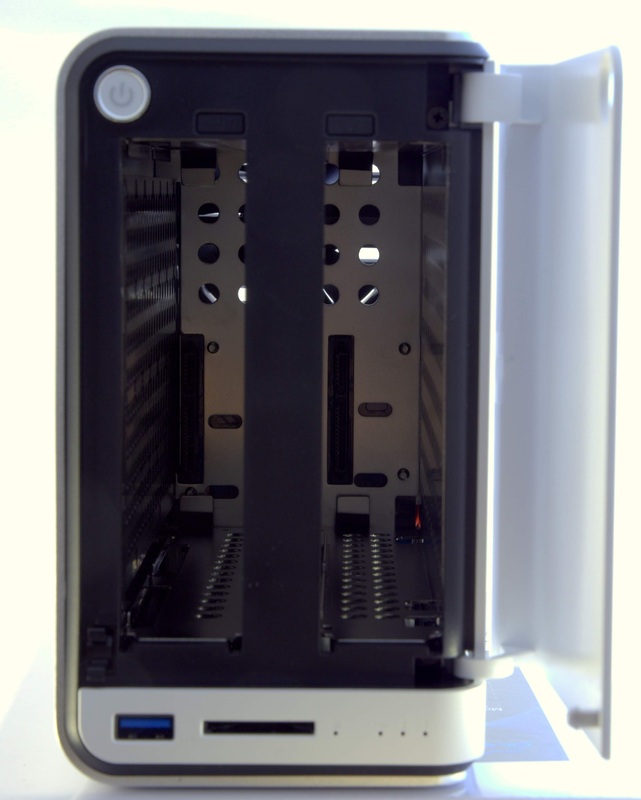 It offers 4 different configurations: Single Disk, JBOD, RAID 0, and RAID 1. Single Disk: Only one of the bays is populated. JBOD (Just a Bunch Of Disks): Both bays are occupied. 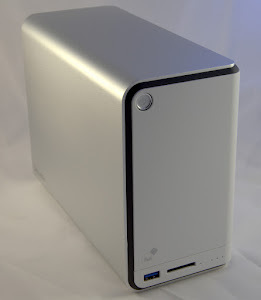 This mode offers the most amount of space if you have two drives of different capacities. RAID 1: Under this mode the drives are mirrored. In case one fails you can recover your data from the other drive. The maximum space available under this setup is the size of the smallest drive. If you have 2x2TB drives in your setup the maximum space available will be 2TB. If you have a 1TB and a 2TB drive, you will end up with 1TB of space. RAID 1 is the only mode that supports hot swap. 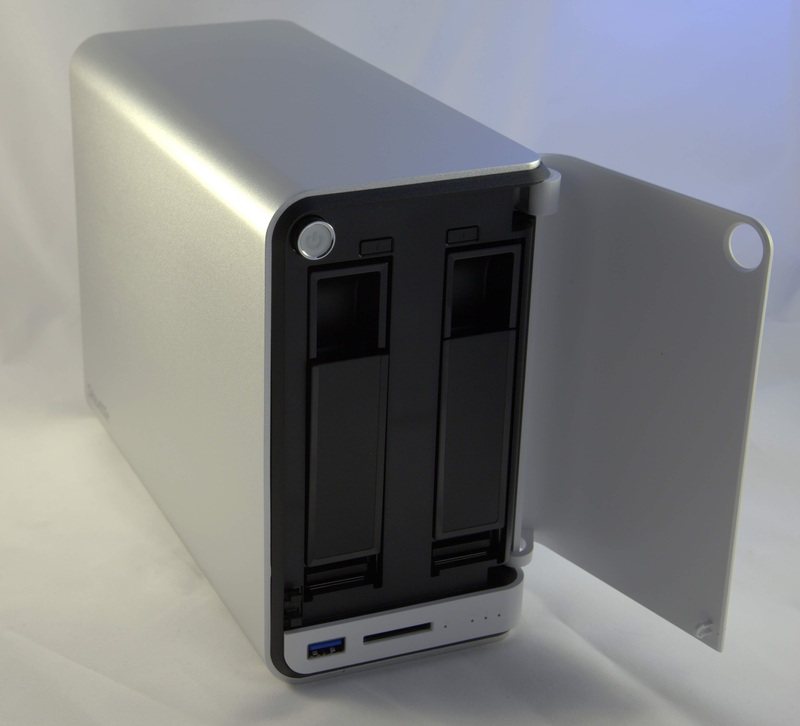 In addition to the two drive bays, KD20 offers 1 x USB 3.0 port, 1 x SD card reader on the front and 2 x USB 2.0, 1 x Gigabit LAN ports on the back of the unit. Any of these USB ports can be used to connect a printer or an external hard drive. 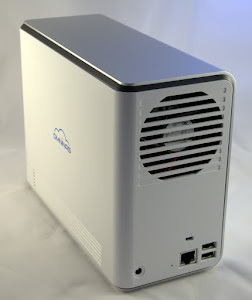 KD20 can function as a Samba file server, DLNA/iTunes media server and an integrated print server. It also supports scheduled back ups and BT downloads. The NAS box is really easy on the eyes and comes with everything needed for a quick installation. 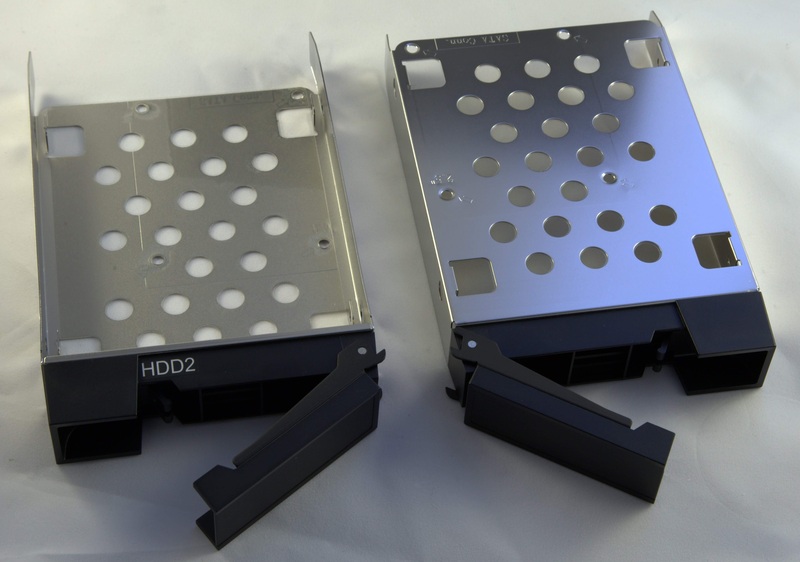 Shuttle provides two bags of screws for mounting 2.5″ and 3.5″ drives to the drive trays. Installation points on the drive trays are well marked for both types of drives. 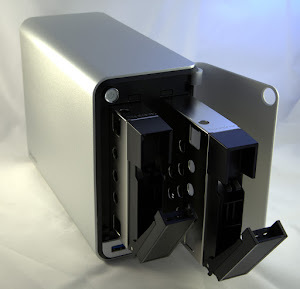 For our setup we used two 3.5″ Toshiba 2TB DT01ACA200 drives. These are 7200rpm drives with 64Mbytes of cache. According to the manufacturer these drives consume 6W during read / write operations, 5 watts when idle and 1 watt in standby mode. 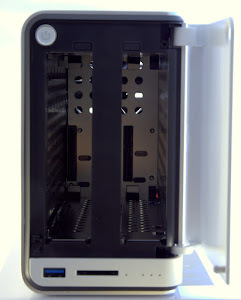 Once the unit is powered on, the setup is accomplished by typing your NAS box IP on your browses window and following the prompts on you screen. 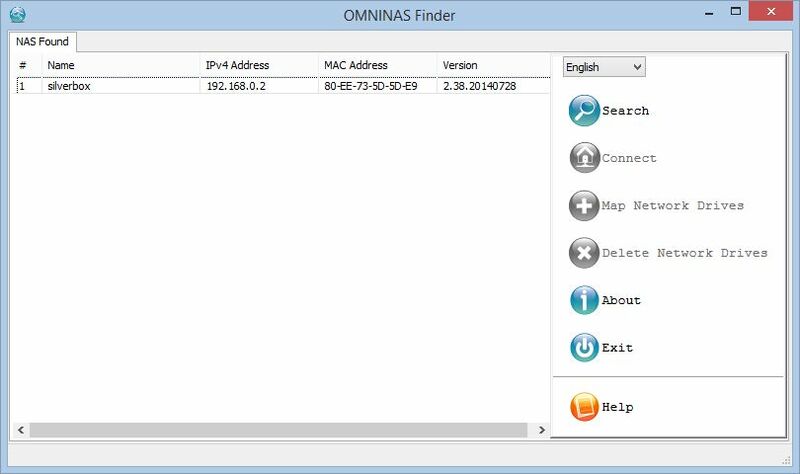 For convenience, Shuttle provides OmniNAS Finder app for MAC, Windows and Android platforms for locating KD20 on your network. Setup through the web interface is pretty straight forward. The wizard walks you through some of the features giving you the option to enable or disable them. It is also possible to change these settings from the main setup screen at a later time. 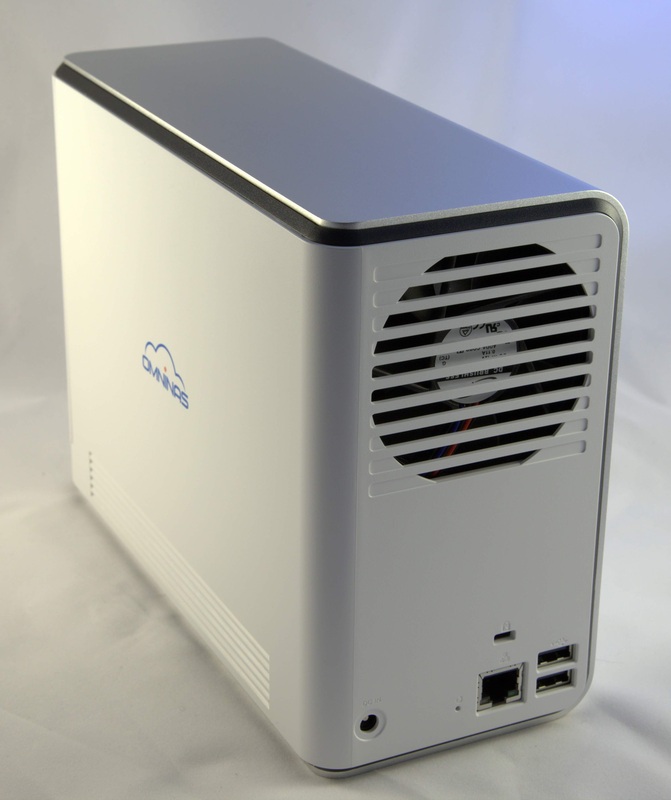 In addition to the Samba file server, KD20 is capable of acting as a DLNA media server, iTunes server and a print server. Print server feature allows you to connect an USB printer to KD20 which then can be shared by users on the network. KD20 allows you to create network shares which behave as separate drives on the network. Using this feature, an administrator can create multiple user accounts and limit access to shares using user credentials. When enabled the autocopy feature copies the contents of a USB storage device that is connected to the front port or a SD card that is inserted into the card reader into predetermined folders. We found the power consumption claims by Shuttle to be in line with our observations. Using our setup KD20 consumes 9 watts in standby mode (disks not spinning), 16 watts when idle mode (disks spinning), and 20 watts during copy operations. These numbers do not include an additional power usage by external devices attached to the box. For example, during coping of files from a USB 3.0 stick, the power consumption was around 22 watts. The built-in cooling fan can be bothersome to some, especially in a quite room, but it seldom comes on and when it does, it spins for a bout a minute or so. 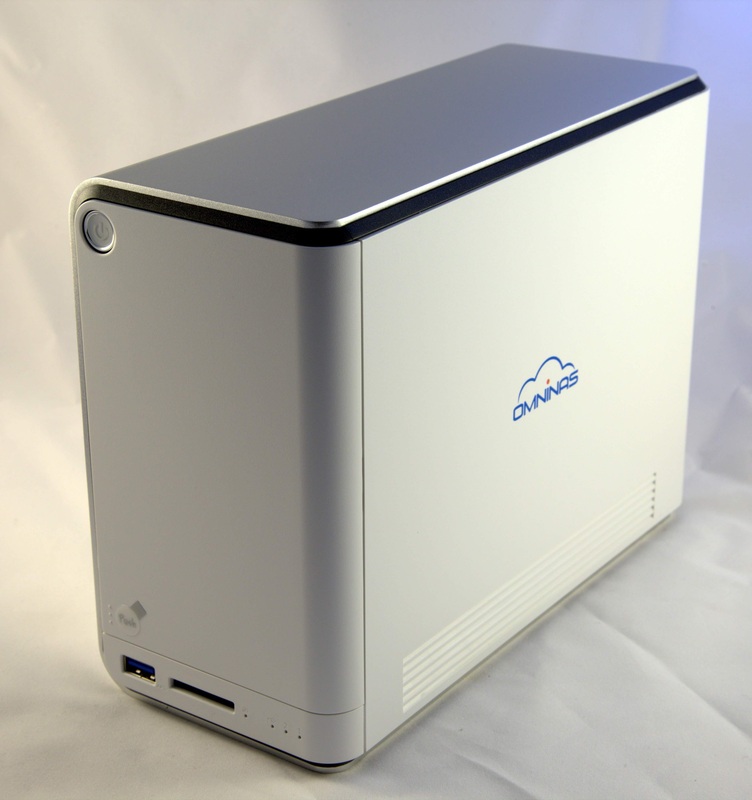 If you need an affordable NAS with simple functionality then the KD20 fits the bill. It is energy efficient and reliable. 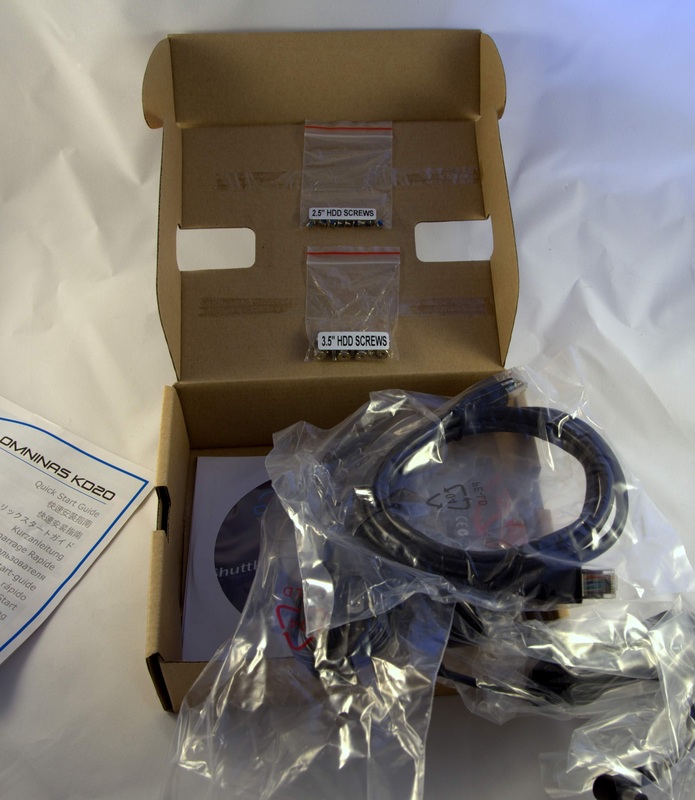 Although we had some connectivity issues with the NAS especially when it was in sleep mode, these issues have been resolved with the latest firmware update from Shuttle. The new firmware also added to ability to shutdown or restart the server remotely.